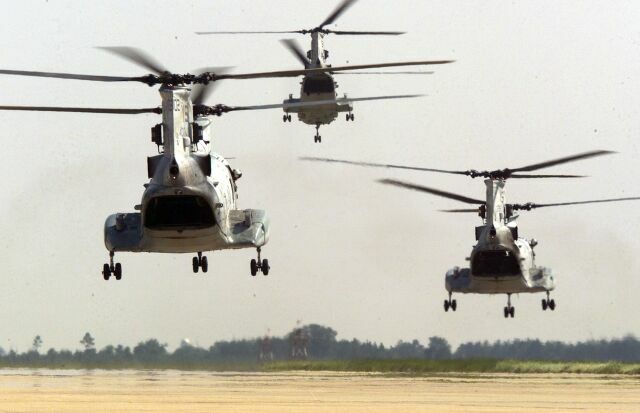 Shaw Air Force Base, South Carolina, USA, 14 August 2000 — Three CH-46 Sea Knight helicopters depart Shaw Air Force Base, South Carolina, after a brief visit to refuel. The U.S. Marine Corps CH-46’s, assigned to HMM-162 at New River, North Carolina, have just been hot pit refueled by a U.S.M.C. KC-130 of VMGR-252 from Marine Corps Air Station Cherry Point, also located in North Carolina. The engines running hot pit refueling, was hosted by Team Shaw as the helicopters transited the area, during deployment to Naval Air Station Atlanta, Georgia, for an exercise.